When you've lived on one Canadian river or another almost all your life, like I have, the term "spring break-up" has very specific connotations. 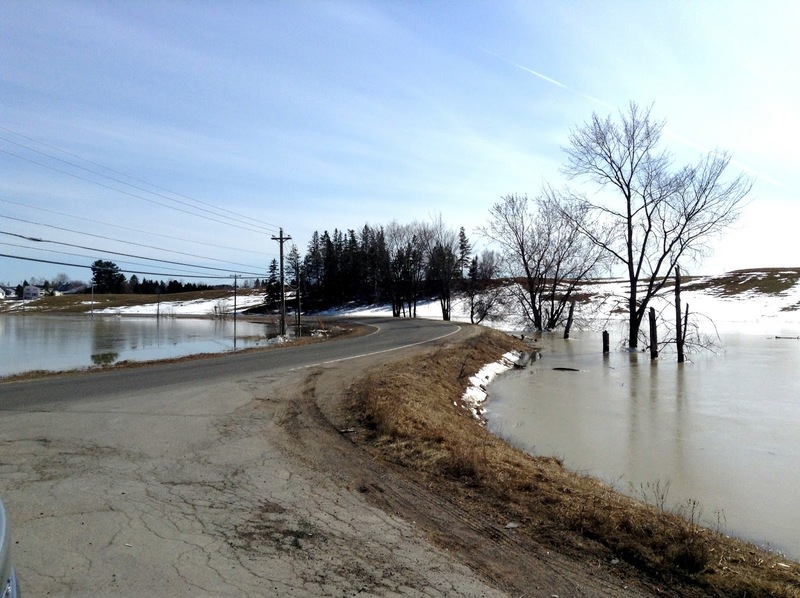 And if you've lived along the Saint John River in New Brunswick, where I grew up, ice and flooding are always part of the spring break-up equation. Like in this photo from 2014 taken when I was home in New Brunswick visiting my mum during the spring floods. This image brings back memories, and not just of that trip in 2014. But I wrote a post about all that back then. You can read it here if you're interested. Today though, I'm not thinking of "break-up" in terms of the ice melting, or the river rising, or the roads being submerged. I'm thinking of break-up in terms of the split that sometimes happens when you grow apart from a loved one. A loved one upon whom you have depended for years. And who has given you great joy. And now, well, now there just isn't that spark when you see each other again for the first time after a whole month. It seems as if you aren't meeting each other's needs anymore. And you begin to feel that maybe it's time you moved on, took a break from each other. A trial separation, maybe. Or maybe you should just split up altogether. Sigh. That's exactly how I've been feeling lately about my longtime relationship with my favourite fashion magazine. I love Vogue. Or at least I always have. Until recently. Recently I've been noticing that Vogue isn't meeting my needs anymore. You see, I buy a fashion magazine for fashion inspiration. I want to see wearable clothes, that are current, in combinations that give me ideas for my own wardrobe. I don't expect to be able to wear the clothes exactly as they are styled in the fashion shoots, but I want to be able to apply at least some of the ideas to myself. I could totally wear something like this outfit from an Elie Tahari advertisement. And I want to be inspired by beautiful creative photos. I understand that many fashion stories are pure fantasy, conveying more of a concept than a recipe for how to dress. And I love those stories as much as I do the more literal ones. But lately, I feel that Vogue has been letting me down on both fronts. I realized this the other day when I was pedaling my exercise bike and leafing through the March issue of Vogue. The March issue is almost as important for 'wish list planning' as the September issue. I expect it to give me the temperature or the flavour of the season, so to speak. I want to see curated collections of what is new, current, hot. I want ideas of what goes with what, and how I might update my current wardrobe. I want to come away with a feel for the season. And I want to be bowled over with creative, beautiful photos. But as I pedaled the other day, I closed my magazine, and thought... meh. Not inspired. At least not by anything that wasn't an advertisement. I had torn out several photos for my inspiration board and every single one of them was an ad. Now, I would expect the work of the team of editors, stylists, and photographers at Vogue to be at least as creative as the advertising created by fashion houses like Valentino or Elie Tahari or Armani. Come on... this is Vogue we're talking about. The gorgeous images above, shot in Kenya by National Geographic photographer Steven McCurry for the Valentino Spring 2016 campaign, have drawn criticism for their ostensible "cultural appropriation." If you're interested, you can read about the backlash the campaign has received, and replies to the criticism from both the photographer and company creative directors in a Huffpost Style article here. 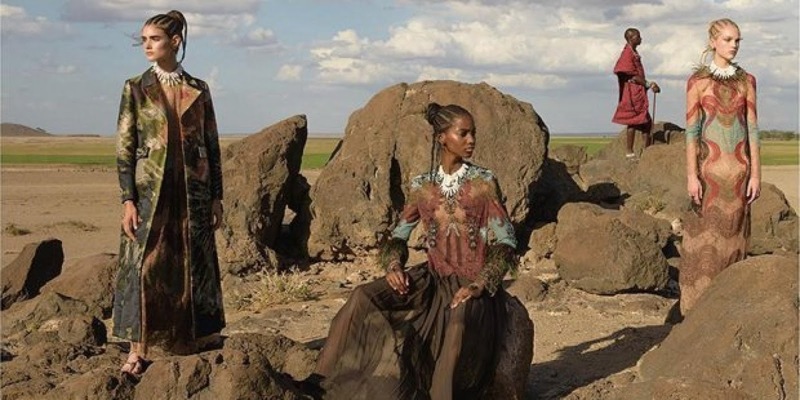 But political and cultural issues aside, one can't deny that the shots, taken in Amboseli National Park which feature models along with local Maasai people, are beautiful. And evocative. And so still. The models in many of the photographs, looking beyond the camera into the distance. I might never wear these clothes, but just looking at these photos made me smile. And the rest of the March issue of Vogue? Not so much. Even shoots styled by some of my favourite creative types like Grace Coddington and Tonne Goodman left me a bit cold. I didn't see anything new, or stunning, or even remotely inspirational. Aside from the ads, as I've said. But you know, the rift between me and Vogue has been widening for a while now. Ever since the Kim Kardashian and Kanye West cover in 2014. Now that was disappointing. A few months ago I signed up to receive Vogue Runway and Vogue.com via e-mail. "It's free, why not?" I thought. First I was overwhelmed by the twice a day e-mails, and annoyed at the over-the-top, hyperbolic, frequently idiotic headlines. But when I was exhorted to spring clean like Kim Kardashian.... now that was too much. Turns out her "spring cleaning" consisted of enumerating how many piles of outfits she was going to sell off. At least the money was for charity. But still, Vogue.com you are history. I clicked the "unsubscribe" button. Phew. That felt better. So, now I'm thinking of pulling the plug on the magazine as well. Clearly we've been growing apart. And the March spring fashion issue disappointment just reinforced that. And then came the last straw. Yesterday, I was pedaling my exercise bike, again. I've been doing a lot of that lately, since there's not enough snow for skiing, and too much snow and freezing rain for walking. So as I pedaled, I watched on YouTube the entire HBO 2012 documentary The Editors' Eye, made in conjunction with Vogue's 120th anniversary. I loved it. And it reminded me why I have always loved Vogue. Until now. Now, I feel as if something is missing. In the HBO documentary, Anna Wintour talks about the courage of the magazine in taking risks, in forging new ground in fashion journalism. But I don't think featuring Kardashian covers, and articles of that ilk takes courage. That smacks of capitulation to me. Still, maybe it's me that's changing. I'm not twenty anymore, but instead creeping up on sixty. Maybe Vogue is simply targeting a younger demographic than they have been for the past few years. Whatever it is, I just know that I'm not finding what I want in a fashion magazine, anymore. And if Ms. Wintour can't see that, then maybe she just doesn't care that much about me, or readers like me any longer. If so, she and Vogue probably won't miss me. When we finally split. I won't say that we'll never get back together, Vogue and me. Just that we need some time apart. I'll be sad, of course. But then again ... there's always Harper's Bazaar. And more fashion blogs 'than you can shake a stick at,' as my mum always says. Guess I'll definitely be playing the field for a while. Spring or whatever, on the Rideau. And speaking of time apart. The shot above was taken the morning before last. This was the scene on the river when we awoke. That's snow, people! So, Hubby and I are taking some time apart from winter, or spring, or whatever the heck you call this crazy season. We're heading south for a couple of weeks. I can't wait. Now... what are you up to these days, dear readers? How's spring out your way? Are you already hauling out the sandals? Or are you like us and believe that spring has decided to take a pass this year? Your thoughts on spring break-ups, spring, fashion fixes or any of the above are always most welcome here. Spring can make us a little restless , planning holidays , new additions to the wardrobe - even spring cleaning & , for me , garden tidying . Perhaps it's the sense of a new beginning ? Your fresh eye on Vogue could be part of that but , to be honest , my love of fashion magazines died a few years ago . I get far more ideas from blogs like yours . Real people in real clothes - you don't do photoshop do you ? Have you really got little legs like me ? You're right, spring always makes me restless. Not good since now that I'm retired and have so much more time for shopping. Re: fashion mags... I think I'm perusing so many more & different sources than I used to when I worked and didn't have time, that Vogue isn't measuring up. Hah. No photo shop for me. Wonder how it feels to have your picture photoshopped so much that when people meet you for the first time they are shocked at the difference? Your Barcelona trip sounded lovely last year. I think you went with your sisters didn't you? I looked up pictures of the architecture at the time... beautiful. Hope you have another great trip, Wendy. I gave up on Vogue a few years back. Now I read only two: Harper's Bazaar UK (which I prefer to the US version), and Porter (which comes out six times a year). I also read Harper's Bazaar, and will now get it more frequently. I have seen Porter, but the $10.00 price tag scared me off. I should take another look now that I won't be buying Vogue. I gave Vogue a try (again) last year but haven't been inspired the way I hoped I would be. So I'm not renewing my subscription. I get all my inspiration from blogs, IG and observing people in real life these days. But I'll have to check out The Editor's Eye - thanks for the tip! I live in the San Francisco Bay Area, and since we have spring-like weather sprinkled throughout our winter, I've been bringing out spring clothes here and there. Also, since we don't really have seasons, I wear pretty much everything in my closet year-round (which is really pretty anti-climatic...). Some of the Instagram accounts are great for inspiration. I just wish that it were possible to share Instagram photos with Pinterest. I wonder do you save on shopping budgets not having so many seasons to buy for? Or do you just get bored more easily? I know I look forward to "turning my closet" in the spring and fall. It's a ritual. I lived in Winnipeg for a number of years so know all about spring breakup. 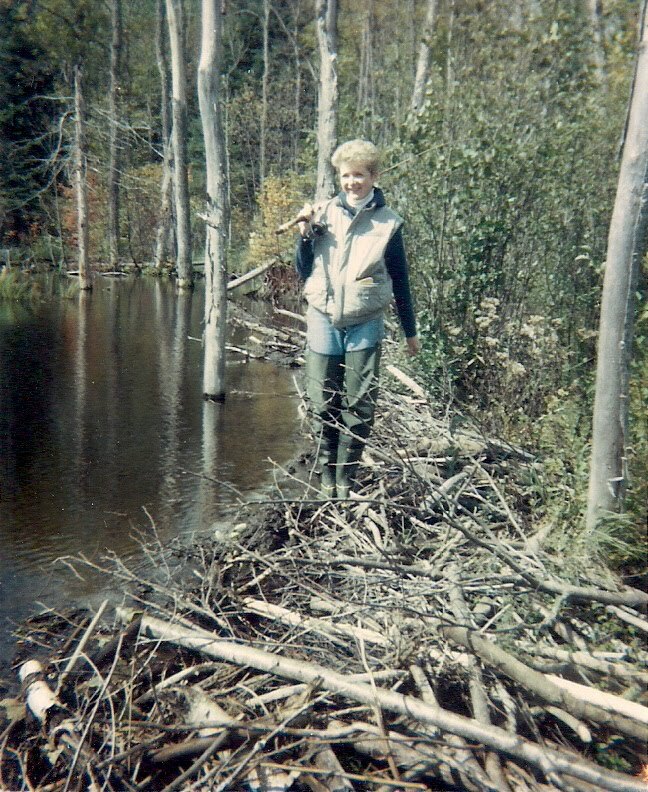 I was there in the year of the big flood - 1997. I have not subscribed to a fashion magazine for years as they no longer met my needs instead, like others, I rely on blogs and the internet for inspiration. Enjoy your time in the sun. I remember that year! My brother and sister-in-law, who live outside of Winnipeg, had to "commute" from the road where they left their car, to their house which was thankfully on a hill via their canoe. Here in Alberta, we had spring last weekend and it seems to be trying to come again, but in between we had a dump of wet slushy snow. That's pretty typical for this can't make up it's mind season! I'll be writing about seasonal wardrobe changes for the next Fashion Friday feature on my blog. This is something new for me, so I hope you'll stop by and take a look. Fortunately, we took the photos last weekend when the weather was lovely. My sister lives in Calgary... I hear all about your variable weather. It plays havoc with her migraines. I will definitely check out your blog, Elaine. I don't read any fashion magazines any more because I feel the way you do about Vogue. 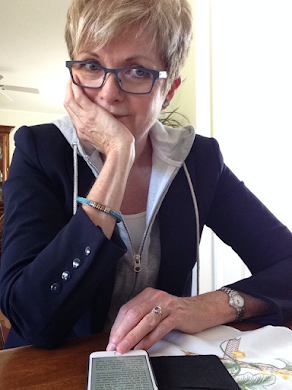 I look to a few blogs--Une Femme, Style at a Certain Age--for inspiration. I read Une Femme as well; she's on my Daily Reads list. There are lots of other great fashion blogs out there to peruse. But I like a hard copy magazine, too. I am so with you on the Vogue front. Such a turn off when these magazines get political in their content and go all out for the celebrities. More met my needs for a while, and Porter is my current favorite..a little more cerebral and artsy. There is something I like about holding a magazine in my hand. Just today I packed away my biggest wooliest sweaters. Determined to soldier on with a trenchcoat and gauzy wool scarf if needed. Open toed shoes area here to stay, but I like to follow rules - no white jeans yet. Ooohhh... too cold for bare ankles or open-toed shoes here. I must take another look at Porter. I love The Edit put out by Netaporter.com, so I'd probably like their hard copy magazine. I fully agree with you. I've cancelled my VOGUE subscription a while ago. Now I only buy it occasionally and only, if there's something REALLY, REALLY, REALLY interesting inside! That's what I'll do from now on... only buy it of it's really, really interesting! Happy Easter to you too. A Blessed Easter to you, Susan! I agree with others who find inspiration on blogs like yours! Though I am built very different than you, I appreciate your insights like bringing out your investment pieces again. I live in a suburb of Los Angeles and, you may laugh, I do change out my small closet. Currently, I have out my sweaters, long sleeve tees & shirts, and skinny pants but as the weather warms up, my shorts (length is under study) and sleeveless tops make their appearance. I just checked out Marie Kondo's organization book on "tidying up" and am hoping to do some clearing out. I have wanted to congratulate you on winning the Twiggy jacket on That's Not My Age! I hope it is you!?! Also, I love your new hair direction. I do not dye my Asian hair but as I age, I found that I have a white/gray/silver (?) streak cutting right across the front of my short do. My hairdresser says I'm lucky but then he also agreed that my right side is much grayer than my left. LOL! That could be a comment on my left/right brain functions! Thank you for sharing your real thoughts on real clothes. I, too, am a retired high school teacher (biology) and am enjoying this smart and articulate blog community that I have found that includes you! Thanks, Charlene. Yes, that was me who won the jacket on That's Not My Age. What nice surprise. Can't wait to receive it and see what it looks like. There is a really lovely blog community out there isn't there? Thanks very much for including me in that number! I gave up on Vogue the year they did a "what to wear at what age, in each decade" issue. The models in every decade were dressed in edgy and interesting day outfits except for the 7th decade model, who wore a Scarlet O'Hara style ball gown. As though Vogue thought, it doesn't matter what an older woman wears, let's have fun and put her in something completely incongruous. I was already bored with seeing pictures of painfully thin teenagers in expensive clothes they would never never wear voluntarily. When this Vogue issue was published, it was the last straw. Although I was only in my fifties at the time, it made me realize that my demographic is not one Vogue wants to aim at, or even be associated with. Mind you, I still happily flick through it at the hairdresser. I'm not sure what the future is for fashion magazines, the advertising that sustained them is usually now on line. My nieces, who range in age from early 20s to 40s, have never acquired the habit of buying them. Their sources for fashion trends are much the same as mine. On line fashion shows, on line catalogues where items are styled in various ways, blogs such as yours which I enjoy immensely, travel, occasionally films, other women, shop windows where the latest shapes are showcased. Like you I love fashion blogs and on-line catalogues where they style the clothes, instead of just presenting the empty garment. But I still like a paper magazine. I'd be sad not to have that anymore. Like hard copy books, I guess. Belated Happy Easter Sue. I hope you're enjoying your time away. Over the last few years certain magazines I subscribed too have sadly been discontinued and others seem to lack content. Few, serious well researched articles and just lots of "same old, same old" Nothing fresh and new. I can't think of one that I eagerly await each month, as I used to. Maybe it's me! So much is available on line now and we can tailor what we read, specifically to our interests. I did buy Porter once at the airport. Good photography, but otherwise seemed quite average and not worth the money. I'd probably try it once more ...again when we're travelling. It's become a habit to "treat" myself to a couple of magazines and some new make up etc as we pass through airports! :) Have a good week! We're not away yet..leaving later in the week...so I'm in full-on outfit planning mode! I used to love the articles in Vogue.... about books and food... they were always well written. That's why I don't like other fashion mags like Style...no articles, and too many celebrities. I must take more time and give Porter a good look when I'm in a bookstore as opposed to the drugstore, where you can't really stand in the aisle and pore over a magazine. I have friends who work at Vogue, and I asked them what the average age of their reader is, given the eye watering price tags on so much of the merchandise featured in the pages... I was told 35. A 35 year old is the woman they target. It makes sense when you read through it, even though an average 35 year old woman generally can't afford most of what is in there. I agree with you about American Vogue; I've never liked it nearly as much as British Vogue, or even French Vogue, both of which tend to feature older models and are just a little less commercial and overly polished than US Vogue. I broke up with US Vogue long ago! That does make sense as a target age. So I guess many 35 year olds must like the breathlessly fawning "Kimye" articles.